The Emerald Conference has become the largest, most anticipated cannabis conference as it enters its fifth year in existence. The conference will be held from February 27th through March 1st and Pickering Laboratories is attending for the first time. We will be represented by Sareeta Nerkar, one of our research chemists. Sareeta is looking forward to the beautiful 15-acre Peninsula, Loews Coronado Bay Resort, but her trip to San Diego isn’t all relaxation! She will be presenting posters on Pickering Labs’ cannabis-related applications, both Cannabinoids Analysis in Cannabis and Edibles and our latest Analysis of Mycotoxins in Cannabis Plant and Cannabis-Containing Products. Hopefully this new conference will be engaging and informative, as Sareeta looks forward to learning about the newest scientific advancements in the cannabis industry. If you’re in attendance, please feel free to stop by the posters and ask Sareeta all about the cannabis applications! For more information about Pickering’s cannabis research please check our our archived article and visit our webpage for the latest application note releases. PITTCON 2019 is the 69th meeting of the Pittsburgh Conference in Philadelphia bringing the world of Analytical Chemistry Manufacturers in one place to exhibit the latest in instrumentation and applications. Pickering laboratories will be exhibiting this year with exciting products and applications. Every year new Post Column products and applications are unveiled to new and current customers to demonstrate how Pickering Laboratories continues to expand the reach of Post Column Derivatization technology to address the new important analysis challenges in the news today. The Pickering Test Solutions product lines continues to expand the number of artificial body fluid testing solutions for product testing applications. New this year is the addition of Artificial Ocean Water to this list and the first product for the Environmental product testing solutions category. Visit us at Pittcon booth 2445 and make an entry in the drawing for a “Bose noise masking sleepbuds” (these are really cool check them out https://bose.life/2KqJsBk ) Plus all the other free stuff we offer. Pickering Laboratories continues keeping an eye on Glyphosate situation around the globe. It has been announced that China is set to introduce Maximum Residue Limits for all imported final foods and raw material at 200 ppb or lower of Glyphosate by the end of 2019. These requirements would include all the grains, soybeans and other legumes. 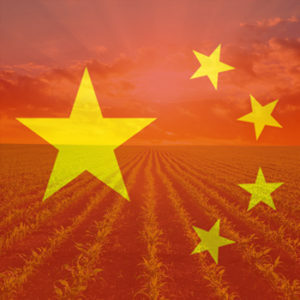 Right now China has no Maximum Residue Limits for Glyphosate so setting such low limits is bound to change the way countries importing food to China use this herbicide. All the foods that will be affected by the new regulations could be analyzed for Glyphosate using Pickering Laboratories Post-column Derivatization Method. The highest level of contamination is found in crops such as oats and barley that are treated with Glyphosate right before harvest to desiccate the plants. Many countries, including the US, established high Residue Limits for Glyphosate in such crops. For example, US limits for Glyphosate in barley is 30 ppm and in oats is 20 ppm. Introducing limits at 200 ppb would most likely cause a decrease the use of Glyphosate as a desiccant and should increase testing. In fact, Australia, one of the biggest importers of food to China is considering banning the use of Glyphosate as a desiccant. Interestingly, the decrease in Glyphosate use will be affecting China’s chemical production industry since currently China is the largest producer of Glyphosate and exports more than 60% of this chemical. But we certainly hope that tighter limits and increased testing for Glyphosate is be adopted by other countries as well for sake of everybody’s health as well as the health of Pickering business. 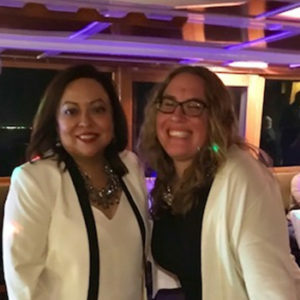 Our customers may not know this, but our very own Gloria Garcia plans an amazing holiday party annually for all of Pickering Laboratories’ employees and their guests. This year our celebration was a dinner cruise on the San Francisco Bay! 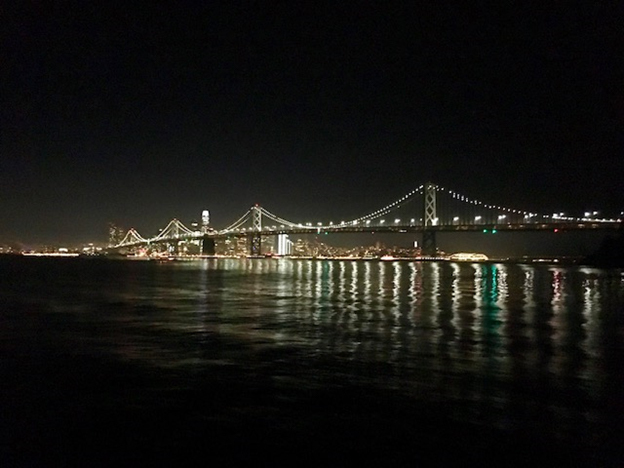 Here’s a taste of our fantastic views of the Bay Bridge and the beautiful twinkles of the city skyline! With such an excellent light show out every window, it took some awesome food and a lively DJ to capture our attention inside. Gloria organized several hilarious after-dinner games to keep the crowd entertained, including a hybrid musical-chairs-scavenger-hunt and a modified hot potato game! 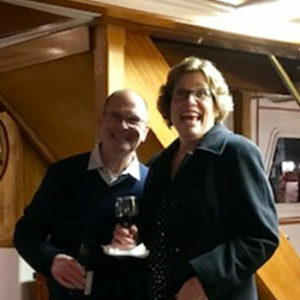 Here’s a great photo of Jim Murphy and Judy Pickering (looks like they found some tasty wine)! Someone captured a live action shot of Gloria and Rebecca (are we on the dance floor?) to share. We enjoyed a great night of good friends, fun games, dancing and plenty of holiday cheer! It was a fun way to close out 2018 and ring in 2019. We send our thanks to Gloria again for her hard work – we certainly appreciated the excellent results and we hope you enjoyed the pictures. From all of us at Pickering Labs, we wish you the very best in the New Year! Pickering Labs would like to congratulate all of our winners for our previous newsletter’s Aflatoxins Chromatography Quiz: Mark Ritari from Anatek Labs, Thomas Scott from Diversified Laboratories, Tom Schneider from Suffolk County Water Authority, Narjes Ghafoori from LA County Environmental Toxicology Lab, Jiufeng Fan from Glaxo Smith Kline, and Ankita Gambhir from KFMC. Winners will soon receive an Amazon eGift Card, redeemable towards a vast array of items store-wide at Amazon.com. Happy shopping, winners! 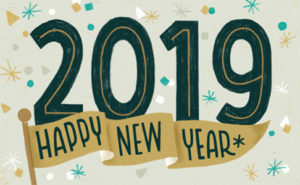 We wish you cheers and success in the New Year! Congratulations to our quiz winners! A decrease in signal could be due to a bad autosampler, old/degraded standard, aged reactor loop, or aged UV lamp in the photochemical reactor. Identify the error made when running the Glyphosate chromatogram below and win a prize! Simply email your answer and your full contact information to Rebecca at rlsmith@pickeringlabs.com by April 1, 2019 in order to win. You will receive email confirmation when your submission is received, and the troubleshooting answer and winner congratulations will be published in the next issue (to be anonymous, please notify Rebecca in submission). 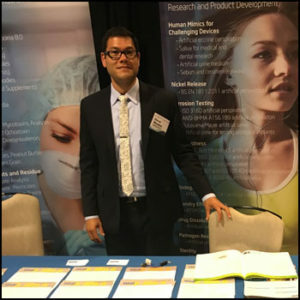 Pickering Laboratories exhibited at the North American Chemical Residue Workshop (NACRW) in Naples, Florida on July 22-25, 2018. Formerly the Florida Pesticide Residue Workshop, this annual event is focused on trace level analysis of pesticides, veterinary drug residues and other chemicals found in food, animal feed, cannabis and environmental samples. Unique to NACRW are the technical sessions, as they are informal and collaborative to encourage conversation and sharing among the conferees. It’s an exciting workshop where every year attendees come away with insightful new information and presenters can get great feedback on their own research. Sareeta Nerkar had exactly this opportunity at her oral presentation of “Mycotoxins in Animal Matrices, Food and Feed” which was well received. There is considerable interest in Pickering’s method for mycotoxins analysis because it is robust, established and economical. Additionally, Sareeta presented our poster “Analysis of Polyether Antibiotics in Animal Feeds by HPLC with Post-Column Derivatization” during the poster session. 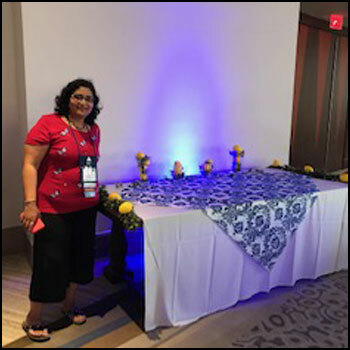 As a member of the NACRW organizing committee, Sareeta chaired the social committee this year. She’s pictured here at the Mediterranean-themed dinner event featuring drinks, games and prizes! The west coast of Florida was experiencing an unusually long red tide event while the workshop was in session. The hotel was about a mile inland, so the health effects were not experienced by the hotel guests although they present a challenge for local residents and beachside visitors. There were some, though, who appreciated the event on a different level! After a presentation on brevetoxins, an attending graduate student related that he took the hotel shuttle to beach in order to experience his first red tide event. 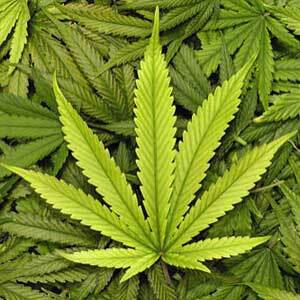 It was so strong that it made his eyes tear and caused coughing – he was thrilled. Other attendees perhaps made less use of the beach shuttle this year than at previous workshops. At our exhibit, Mike Gottschalk offered literature on several post-column environmental testing applications including Glyphosate, Gluphosinate, Carbamates, Mycotoxins and others. Mike and Sareeta hosted a raffle for an Amazon Kindle this year, and we want to congratulate Thomas Scott from Diversified Laboratories on his winning entry! Our exhibit also included the Pickering Test Solutions product line for consumer product testing. We are excited by how much interest there is in artificial body fluids from laboratories needing standardized solutions for their industry testing requirements. For us, the workshop was a great success. We hope you enjoyed attending as well! We are already looking ahead to next year’s workshop, when we will have more exciting research to share. Please visit www.pickeringlabs.com in the meantime for our latest product offerings and updates. Pickering Laboratories, Inc. exhibited at the National Environmental Monitoring Conference (NEMC) in New Orleans from August 6 to 10, 2018. We enjoyed the great posters and talks ranging from technical issues monitoring environmental samples to challenges with cannabis testing. We hosted a booth where we met new leads and supported some of our long-time customers. Handfuls of fidget spinners, cooling towels, emoji pens and of course our trustworthy calibrated rulers were gifted to attendees that stopped by. Rebecca Smith presented our poster about Glyphosate in Foods. The method abstract can be downloaded here. Also on display at our booth were handouts for our Product Testing Solutions product line. It was great catching up with our customers and meeting some new people at the conference! We hope everyone who attended enjoyed the technical talks and New Orleans food as much as we did. The next NEMC meeting will be held in Jacksonville, Florida from August 5 to 9, 2019. We’re looking forward to it!